A small group of us met and walked the labyrinth together last Monday. The evening was warmer than I anticipated. We all commented on that actually. It was warmer than we anticipated, but the shelter of the trees on the path and an occasional breeze made it a pleasant night to walk together. The labyrinth at the back of our property gets a lot of use during the week. A whole lot. Maybe you didn’t know it, but we have some of the most prayerful deer in St. Croix County. They walk the labyrinth often twice a day. This year, it seems, a doe had triplets and they can be seen walking on and around the labyrinth just about every afternoon. But deer aren’t the only ones who use the labyrinth. Even before our labyrinth was revealed to be the site of two supply gathering stations on an augmented reality game played with smart phones, it was a stop used occasionally by walkers in our community. I don’t know who they are. I don’t know how often they come. I don’t know how or if they pray while they walk, but people come to walk on our peaceful garden labyrinth and I trust their experience blesses them as my walks bless me. I have begun to walk the labyrinth quite frequently – usually at least once during the day and often once in the morning well before I come to work and once in the night when I have to use a flashlight to see where I am going. I walk during the day when I am stuck – when I can’t find a hymn that is just right, when a sermon doesn’t seem to know where it’s going, when my body has been sitting in one place too long and my mind can’t create anything but what it has already created. I walk in the morning and evening because it is a safe and familiar place to go a long distance without having to worry about making decisions about where to go. I’m never far from home, and yet I’m covering a lot of ground. The path is compact, contained, but it isn’t necessarily short. “You hem me in, before and behind,” the psalmist says of God. Labyrinths, I remember learning when we were preparing to have ours installed a number of years ago, were created by ancient people on every inhabited continent. They are older than the relatively recent resurgence they have had in Christian spirituality. Actually, they are older than Christian spirituality itself, some dating up to four and half thousand years ago. How labyrinths have been used across time and space is not always known, but what seems to be true is that across culture, religion, and in walking a single circuitous path humankind has found meaning, maybe purpose, maybe peace. In the medieval Christian tradition labyrinths were sometimes used a part of or even a substitute for a pilgrimage. Either built at a holy site or made to represent the holy land, pilgrims would make a journey to a labyrinth in devotion to God, walking to represent the journey of life and faith. Sometimes at the end of a long pilgrimage the faithful would even complete their trek walking the labyrinth on their knees in humility and gratitude before God who had brought them safely to their spiritual destination. A labyrinth can represent a walk with God – a single prayer or a lifelong journey. There is one single path toward the center in a labyrinth. It is a not a maze with decisions to make or dead ends that stop a journey. It is not intended to confuse or deceive the one who walks. Yet with its twists and turns, as it moves closer to the center at times and farther away at others it can represent the relationship we have with God or the Body of Christ, the church, a relationship that isn’t always easy, isn’t always clear, isn’t always a straight and direct path. But in answer to the psalmist’s questions, “Where can I go from your spirit? Or where can I flee from your presence?” the labyrinth says for God, “I am here. I am with you. I hold your journey.” The sacred circle surrounds those who make the prayerful journey. They cannot depart from the spirit of God. They cannot flee from the divine presence. The labyrinth itself holds our path, knows our coming and going. The labyrinth is acquainted with all our ways and does not force our steps, but welcomes them, guides them, and points us, knowingly to the center. As I said at the beginning, a few of us gathered on Monday evening to walk the labyrinth together. The labyrinth as a communal spiritual discipline is somewhat different from other acts of faith we might do together as the body of Christ. When we worship or pray together we often join our voices, speaking or singing together in unison or in holy, responsive conversation. When we serve together we join our gifts and our actions with others in order to affect some sort of change together or produce some kind of good. 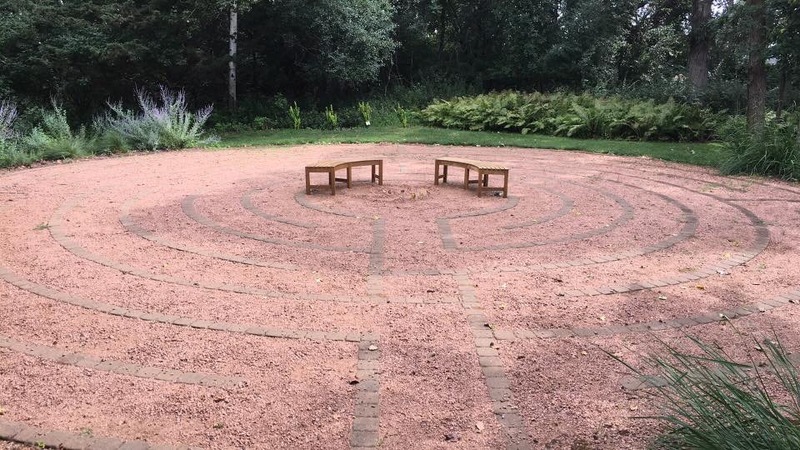 When we pray the labyrinth together, the together is not so much a time of working together, as it is a time of simply sharing space, sharing the experience, and knowing that we are not on this walk alone. The four of us who were there to pray on Monday night gathered at the entrance to the labyrinth. I opened our time together with a spoken prayer before we began our walks. Following the amen, the first pilgrim stepped onto the path. Quietly – – but not silently – – she took slow, deliberate steps forward to the first left hand turn. When she had traveled a little further the second pray-er began the journey, then eventually, the third, and finally I took my steps onto the path. The gravel crunched under our feet as our steps moved us forward on the way – each of us walking in conversation with God, each in our own prayer, and yet always together within the sacred circle, within the care and provision of God. Until this one moment somewhere in the middle of our time together. In this one moment I looked up and saw all four of us on the southern half of the labyrinth, all four of us facing west, all four of us going in the same direction. It lasted for a short period, for enough time, before one and then another of us, and eventually all of us took a turn on the path and our journeys were again our own, but still within the reach and the realm of God. This labyrinth walk seemed fitting before I walked into a session meeting to inform the leaders of this church that God is calling me to serve another. The walk demonstrated what this whole experience of call and pastoring and church is about. I imagine each of us, and all of us, individually and uniquely knit together by the crafty and creative hands of God. Each of us, and all of us, fearfully and wonderfully made. I imagine God whose knowledge of our lives individually and our life together is complete, is wonderful, is so high that we cannot attain it. And I imagine this path, this way that we walk, that can never take us away from God’s spirit, that is never beyond the circle of God’s presence. We are called to walk this path together, but not always in unison, not all at the exact same place at the exact same time. As some are moving toward the center, others are turning away. As some are going left, others are going right. As some walk slowly others are speeding toward the next turn. We are called to walk this path together held by God, hemmed in before and behind by the crafty and creative hand of God, and at some point in time, for just the right amount of time, enough, we are all going in the same direction. Here are First Presbyterian Church we have been in that period of just enough time, of walking in the same direction, of moving forward in faith, of listening and responding to God’s call, for almost 9 years. The beginning felt like we were trying to find our way at first, getting our steps and directions aligned, and in some ways I imagine the end will, too, as we start to make turns and our directions change. But for almost 9 years we have been walking on this path and moving forward in love, held by God’s grace, and for that I could not be any more thankful. Over these next few weeks, I pray that we will celebrate the journey we have shared. I pray that we will give thanks to God for his presence and blessing. I pray that we will practice trusting that God’s spirit will never leave us, that God knits our lives and designs our paths with her own hands. And I pray that we will continue walking together in faith and in love until our paths turn. Will you join me in this walk and this prayer?